I'll admit, I don't remember if I ever played the original Alien Breed from Team 17. The classic title was released on the Amiga back in 1991, with a DOS port a few years later. The original shared a lot of similarities with the likes of Smash TV, placing players on a shape infested with aliens, fending off wave after wave in dual analog control fashion. 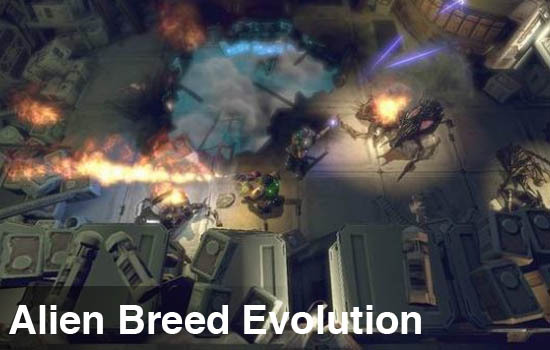 Now many years later Alien Breed is back in the form of Alien Breed Evolution, once again from developer Team 17. Despite there being almost twenty years since the original, not much as changed in terms of gameplay for Evolution. You'll make a frantic run to find the elevator fending off giant bug like aliens of various shapes and sizes, only to find the next floor on the ship has even bigger and badder bad guys for killing. The story is told between levels in black and white comic book style cutscenes, though, does anyone really play these games for the story? Weapons are found throughout the level with a few different varieties like assault rifles, shot guns, and laser rifles. It wouldn't be an alien survival game without a flamethrower, which is particularly impressive when in use. Sadly, like all weapons in the game ammo is limited and in high demand. You'll have to rely on your secondary items like grenades, health packs, and turrets which can be mounted on special platforms located in specific areas of the levels. You can find these located in the dead bodies and lockers through out the exploding ship to aid in your survival, though searching them takes a few seconds of time, something you don't always have. Alien Breed's difficulty is immense, even on the medium difficulty level. Some of this comes from just how dark the game is, the tiny flickers of fire or your flashlight become the only light in an area to see your impending doom. The Unreal Engine 3 powered game is as gorgeous as it is dark; you'll welcome arcs of electricity across the floor if only to see the oncoming alien horde. Thankfully there is a radar that helps, but it can be frustrating. I may have cheated by cranking up the gamma in the options menu...I may have. I was pretty surprised at how meaty the single player game is, and despite in game level completion times of about 30-40 minutes each (there's 5 levels), the difficulty makes the levels take even longer. The levels themselves are pretty linear, and you'll constantly be doing a lot of backtracking. There's a whole lot of - "Flick on the power switch" only to find that you need to "power up the generator" type moments. Alien Breed Evolution also offers a two player local and online co-op mode. Called "Co-Op Assault" this mode takes sub sections of three of the five levels for two player action. The aforementioned backtracking is mostly gone and instead it's an all out battle straight to the elevator. 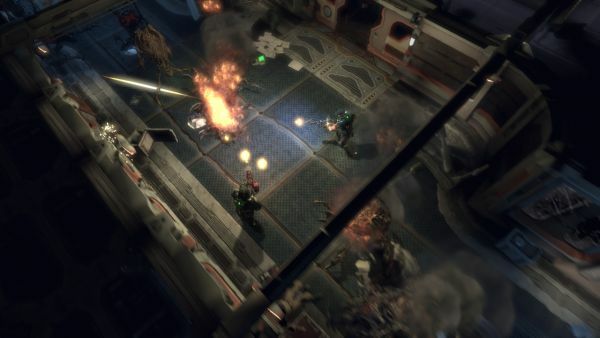 Weapons and ammo become even more crucial in co-op, and if one player dies the other must hang on long enough for the other to respawn or it's game over. No check points, to saves, just right back to the beginning. The co-op levels are shorter though, each one took less than 20 minutes to complete. If there's one major gripe about co-op, it's the lack of camera control. Alien Breed Evolution is actually Episode one of a three episode series. While it's an Xbox Live Arcade exclusive right now, a PC and PS3 version will follow in the Spring of 2010 with presumably the rest of the episodes. While the co-op mode isn't the game's focus, the style of game lends itself well to cooperative play. We can only hope it's more tightly integrated into the game's two sequels. There's quite a bit of value to be had in Alien Breed Evolution as it stands now, and while it's not the kind of game that warrants any major story, it'll be interesting to see where Team 17 takes things. The Co-Op Experience: Team up through a separate cooperative campaign with friends. Page created in 0.2634 seconds.